Doris I. Perich, 95, checked out of Heritage Villa #5 on January 14th and checked into Heaven’s Gates where the rent is eternally free. She was born in Akron, OH. She graduated from North High school and later attended University of Mount Union. She worked for Bell telephone for several years before retiring to raise her children. 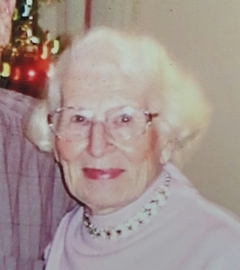 Doris enjoyed reading and was an avid game enthusiast. She and her dear friend, Carolyn, would spend hours playing Rummy and depending on who was keeping score, determined the winner. For several years, Doris tutored elementary students in math, reading, and writing. She worked tirelessly as a volunteer for various organizations. After the death of her husband, Thomas, she became quite independent in both life and politics, which often generated lively debates. She enjoyed traveling. Her first destination of many years was to Canada with her family. She then took trips up the Eastern Coast from Florida to Maine and later, took a trip out to Colorado with her daughter, Sue. Her most adventurous trip was to Mexico with her beloved boyfriend, Will (after Thomas, of course). Doris loved the outdoors. She loved to go hiking with her hiking club, bird watching, going on picnics, and fishing. She loved music. Self-taught, she played the organ, piano and the mandolin. Her greatest achievement in life was her family. Everything she did, she did for them. Her love for her extended family was comparable to no other. Spending time with her family was her top priority. Doris will be best remembered for her quick wit, infectious smile, and flirtatious ways with any handsome man who stood before her. You would never see her without her blush on her cheeks, hair combed, and lipstick applied to perfection. She was a crowd pleaser-always the “Belle of the ball” and could get away with the rudest of comments, only to be taken as a compliment. Preceded in death by her husband of forty-seven years, Thomas, sister, Beaulah, as well as many much-loved brothers and sisters in law. And finally, her boyfriend, Will Moss. Doris leaves behind her three children, sons, David (Paula), Richard (Kathy), and beautiful daughter Susan (Glen) Yeatts, grandchildren, Steven (Danielle), John (Yami), Suzanne (Ethan? ), Joey (Katelyn) Yeatts and Stephanie (Matthew) Brown and seven great grandchildren. We wish to extend our great appreciation for her caregivers at Heritage Village. A special thank you to Brooke and Kim who went above and beyond to make her feel at home and loved. In lieu of flowers, the family asks that you take a moment to visit the elderly; read a book to a child; show an act of kindness to a stranger; or contribute a small donation to either Alzheimer’s Association or the Wounded Warrior Project. Funeral services will be held Friday, January 19, 2018 at 7 p.m. at House of Eberhardt Funeral Home, 472 W. Turkeyfoot Lake Rd. (Rt. 619) Portage Lakes. Family and friends will be received Friday from 5 p.m. until the time of the service at the funeral home. A private burial will be held by the family at a later date.